Aug, 2015 - outside singout, outstanding job on cake decorating! Nov, 2016, Outside Performance in Providence - Hi Santa! HAPPY VALENTINES DAY ! - CAN WE SING FOR YOUR EVENT THIS MONTH ? 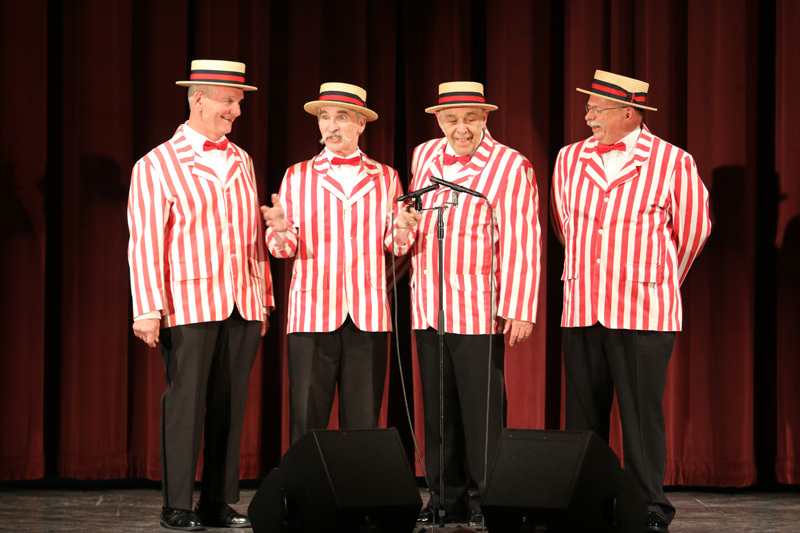 GENERATIONS is an acapella, barbershop quartet, who can SING -either DAY or NIGHT :-) - for your EVENT! We can sing FOR events, such as, birthdays, anniversaries, weddings, sporting events, holidays, and other functions (eg, funerals). We can sing AT various locations, both inside (eg, homes, businesses, senior centers) and outside (eg, outside fairs/ sporting events). SUMMARY: REMEMBER TO CHECK OUR PHOTOS - And you'll LOVE our jackets :-) ! THEREFORE: We would love to sing for your event! AND - we will coordinate the details of your special event with you! Since every performance is unique, we will work with you to coordinate the performance with your needs. However, here's a sample of our performances. We have different outfits depending on the needs of the client. Our most requested outfit is the traditional Red & White Striped Jacket with red bow tie and straw hat, as seen in many of our photos. We have a repertoire of about 40 songs, and will work with you to choose the songs that best fit who we are singing to. Then before our performance, we prepare "the plan" - a song list for your performance. During the show. we will talk about the songs that we are going to sing and give a little history on them. We always try to include one or more "sing-a-long" songs at some point during the performance. (One note - we have sung at both elementary schools and Senior Centers, so we change our sing-a-long songs to match the ages of our audience!) And we are always amazed at the number of people who sing along with us! We can also do a short section of a song, explaining each of our four harmony parts (which is the basis of acapella, barbershop harmony singing). Finally, we'll blow the pitch-pipe for the starting note, and then sing the entire song in our four part harmony! Priceless for newcomers to this style of music! Lets not forget our personalities - we might even tell a joke or two! At the end of our show, schedule permitting, we tend to stick around for a bit and talk with the audience members on a one to one basis. People we meet and sing to all seem to have a story to share about seeing a Barbershop Quartet, or have a family member that once sang Barbershop Harmony ! And we can share our experiences, too ! If you are looking for entertainment that is a bit different from the every day, then Generations can fill that bill. Here's a short summary of who we are, and what we do - just let us help you! We are an acapella Barbershop singing type quartet. We have a total of over 170 years of 4 part harmony singing in various music styles ! Our ages total up to 294 years! (we all started very young) ! And best - we are an active quartet throughout the year, and can sing for you on a weekday or weekend, BOTH DAY OR NIGHT! With approximately 40 songs in our repertoire (holiday songs not included), we can easily fill a one hour show. The majority of our songs are popular tunes from the 1890's to the 1960's (don't forget to see our list of songs or "set list"), and we can find many other requested songs in our Barbershop Society's reference library! And we always try to included one or more Sing-A-Long songs with the audience. This brightens their day as we'all sing familiar songs, bringing back many fond individual memories, and to once again enjoy community singing among all of us! We have numerous outfits that we can wear, but the favorite is the old fashion red/white striped jackets with the straw hats. CHECK OUT OUR PHOTOS in our profile :-) ! So whether you are looking for someone TO SING inside or outside, AT home, work, a Senior Center, or a function hall, AND TO SING FOR a birthday, anniversary, wedding function, sporting event (eg, the National Anthem), or a full show, we can definitely help you out! We have done these types of performances before, - just contact us to coordinate details of the performance you are requesting. We look forward to working with your next show request! CAN WE SING FOR YOU?? We can sing just about anywhere, either strolling or on a stage. If we are performing in a large room with a big audience, we usually need a sound system with 2 multi-directional microphones. If you cannot supply a sound system, we can provide one at an additional charge. However, we normally do not need a sound system when singing in either a smaller room (or a home, or backyard, or strolling to sing at various tables), or an area with good acoustics. Zip A Dee Doo Da.